Violinist, Ela KodÅ¾as, was born in Rochester, NY, and began playing at seven years old. In her sophomore year of high school, she began lessons with RenÃ©e Jolles through the Eastman Community Music School. 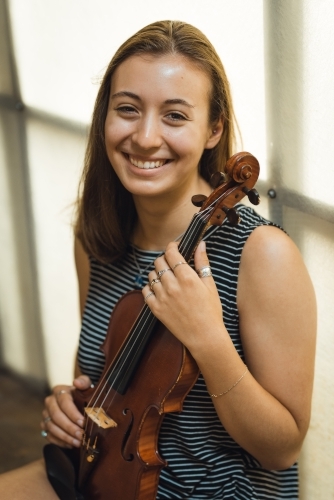 While enrolled at the ECMS, the quartet she was a member of, the Carriage String Quartet coached by Steven Doane, was chosen as a semi-finalist in the Chamber Music Festival of New England in 2016. In April of 2017, she was awarded the Douglas Lowry Award by the Rochester Music Hall of Fame and had the opportunity to perform in Kodak Theatre at the Induction Ceremony. Ela has performed in masterclasses for Joseph Silverstein, Nadja Salerno-Sonnenberg and the Jupiter Quartet. Other instructors and coaches include Oleh Krysa, Juliana Athayde, Jeffrey Multer, Cynthia Roberts, Nigel Armstrong, Solomiya Ivakhiv, and members of the Ying Quartet. She has attended the New York Summer Music Festival, the Bowdoin International Music Festival and the Eastern Music Festival. While at the Eastern Music Festival, Ela served as concertmaster under Maestro Gerard Schwarzâ€™ baton and also won the concerto competition, performing Bruch's Scottish Fantasy. Ela is also a member of Eastman Collegium Musicum, Eastman's early music ensemble, led by Paul O'Dette. This fall, she will be entering her junior year at the Eastman School of Music, studying with RenÃ©e Jolles.